Your art will shine in this sizzling metal picture frame in frosted copper. Its slender lines and flat, square face give a thoroughly modern look. Add a wide white mat to make a grand statement no matter how small the space. With subtle brushed outer edges, everything about this picture frame says sophistication, while the price tag says value. Ships unassembled. Includes spring-clips, wire & corner brackets for easy assembly & hanging. Your satisfaction is guaranteed. I've used many of your 111 and 222 frames for photos and collages and although I'm clumsy, I put them together without a problem. I order the 11" x 13" size instead of the standard 11" by 14" for an 8 x 10 picture--I like the space the same all around. I find for small shapes in the photo that I am framing, a 1 1/2" mat works fine--for a large portrait that fills the space, I would get a wider mat. Thank you for your review, and we appreciate you sharing your beautiful photo with us! I ordered 5 frames...I got all but one set of hardware. Otherwise, I am really pleased with how easy it was to assemble the frames and how well they fit my work. Thank you for such great service. Thank you for your great review! I am so sorry to hear you were missing items from your order, it looks like we have since shipped out the hardware you were missing. Please let us know if there is anything else we can help you with. I ordered 3 8x5, 1 8x12, and 1 16x20 and the sizes are exactly what I needed: not too big or too small for what I wanted. The color is perfect! Once the instructions are read through carefully, they’re easy to assemble. High quality frames! I wanted a copper color metal frame that could endure outside weather conditions. Hopefully, this will do the trick! This is the only place I could find the soft copper color that was needed for the art work. The shipping price is too high for such a small order and much higher than it used to be, but they have what I need. Easy purchase and often difficult to find metal copper frames! Looking forward to receiving it! I like a very low profile, and contemporary style frame. I like muted colors, don't tend to like gold and black isn't always suitable. I find a brushed or frosted copper to usually complement most color landscape photographs. Copper is very in right now. I am framing a 3 panel greeting card that is green glitter with black writing and a touch of copper and purple. This frame will pick up the copper in the card. I anticipate that this will be perfectly complimentary to a unique painting .. its subtle, modern and minimalist in design. The color and finish are hard to come by. I can't wait to see the effect it has on the painting. Just got this for another picture and liked it so much I reordered for 2 other pictures. Used to be a professional framer - like the way metal frames go together. This color is what I need! I sell my paintings in the summer in my husband's jewelry store located in Kennecott, Alaska, a copper mining ghost town. it is located in the Wrangell-St.Elias National park. I like the simplicity of the design and the color goes well with the colors I use the most. Matches several others I purchased earlier. Good neutral. My go-to frame. I ran across an old panoramic picture of my 6th grade class from 1979. The picture was never protected and has faded with time. To capture the essence of the time and to match the muted, faded colors, I chose this frosted copper color to match the age of the photo. I also want to preserve this picture while it is still salvageable. If I order a 16” x 16”, does that price include all 4 sides? Hi Lisa. Yes, this does include all 4 sides of the frame. Thank you! What will go in this frame (24 X 31) is going to be rather heavy but the overall depth of it is 3/8. Will the frame hold it? I plan on putting binding bolts thru the assembled image at strategic points so the frame won't be carrying the weight. The bolts will also serve as hanging hardware on the backside of the material. It just has to contain the assembled image without bending. its more of a decorative touch. I can't get a sense for how fragile it is. It seems so thin . .. which I love .. .but hoping this will work. I had intended to secure the layers of the image with 1/4" clear acrylic u channel but until I got all the layers assembled it exceeded the slip over channel/edgings capacity so I'm now looking at a more traditional framing to edge the image. Its hard to describe what I'm doing but you have handled the frame I'm thinking of ordering and I haven't. Does this sound doable? BEST ANSWER: HI! The frame is delicate but not so delicate that it will warp that easily. I have a poster weight picture in it, so I haven't tested them with anything really heavy or thick. But if you plan to have the picture held up independently of the frame, I think it would be fine as long as you don't try to force all the layers of your picture into the frame. Prior to buying the frame I ordered samples and that really helped me make a decision, it was worth the extra cost. It is really pretty and I've been happy with it. Hope this helps! If you are putting bolts so that the frame isn't carrying the weight, you should be fine. I only have have a piece of artwork and a matting in my frame. I had bought the artwork framed years ago and the frame was ugly and thick, so finding this frame was perfect for me. I like a more contemporary look. And the color shown on the website is spot on. The frame IS lightweight......Good luck! Not really sure, might work since you say that you are not hanging by the frame itself. I have a 24x36" print with 1/8" acrylic and the frame does bend slightly if I pick it up by the center only, would have to mount it with 2 hooks and then it shouldn't bend, hanging off the wall. Both the HS or 711 models are much more rigid but have a 1" channel. Hi Mary. We suggest ordering a sample of the moulding so that you may see and feel before you place your order. We offer 3" pieces and corner samples. You can order online or by phone at 1-800-332-8884. Thank you! Ithink it would work; it's a pretty sturdy metal. Can the 111FCP frame be used for a canvas? BEST ANSWER: I don't do much framing of canvas but it probably won't accommodate a stretched canvas. If it's mounted on a board, possibly. The rabbet height is barely 1/2 inch. I would suggest requesting a frame sample before ordering the full frame. It might be difficult unless the canvas is really thin, the frame itself is only 3/4 of an inch wide from the outside. It was just right for a poster with some foam board behind it. Hope this helps! I would not recommend this for stretched canvas, this is a very shallow frame best suited for prints. NO, the channel is too small, you need a 1 inch wide channel at least. 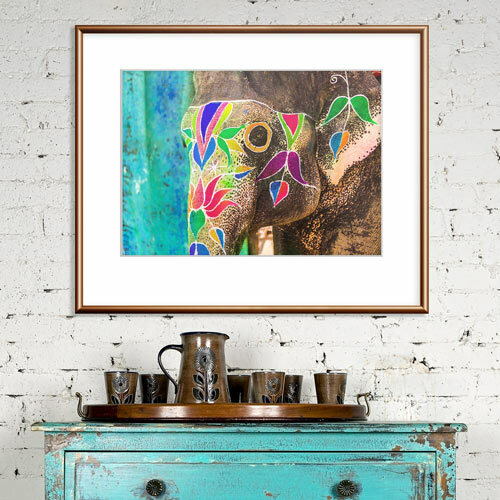 I do not need foam core but can I purchase just the acrylic glass with frame for my artwork? BEST ANSWER: Hello Mary. You can absolutely purchase the acrylic without the foam core. This request can be made over the phone. Please give us a call at 1-800-332-8884. Happy Framing! Hello - is a glass or plastic front included in this frame purchase or is it just the frame? BEST ANSWER: Hello Mallory. Thank you for reaching out to us. Acrylic glazing and foam core backing kits are not included with the frames unless you are ordering and ' all inclusive frame'. 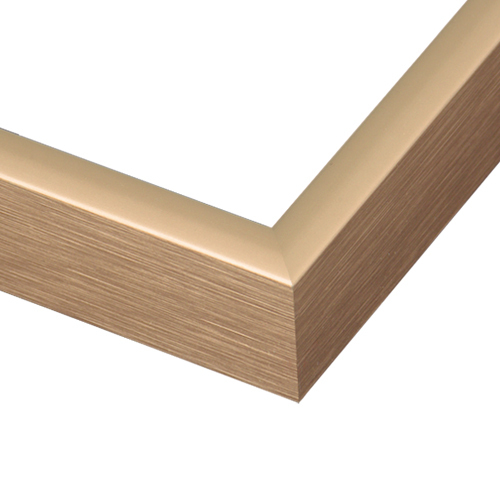 We don’t recommend glass for frames, we offer picture-frame quality acrylic which is plexiglass. We have found that customers framing Canvas do not need glass, therefore, we do not include acrylic with every order. If you have any further questions, please let us know. Have a great day! Does this come with a glass front to cover my picture or is this literally just a frame? BEST ANSWER: Hello! Thank you for your inquiry. Unless otherwise noted on our site or catalog, our frames don’t automatically include acrylic glazing and foam core backing kits. We don’t sell glass for frames, we sell picture-frame quality acrylic which is plexiglass. Glazing and backing kits are not included automatically because not all artwork or customers need them for framing. Canvas paintings, for example, would be damaged by glazing of any kind. These are offered as separate add-on items during the ordering process which can be added after a frame size is selected. If you need further assistance, please let us know. Happy Framing! My print is 14 1/4 by 41 inches ---how big should the frame be ? i want a 2 inch mat ---should the frame 16 1/4 by 45 or what? BEST ANSWER: Hello! Thank you for your inquiry regarding our Custom Frames! 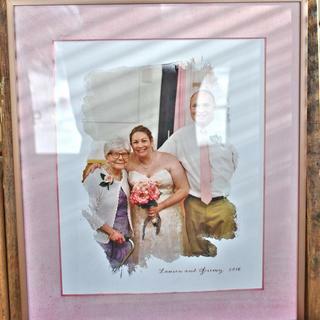 The inside dimensions of the frame should be the same size as your artwork including the borders of the Mat. The website will automatically calculate the frame size you need based on how wide the borders on the mat will be. Please start by entering your artwork size at 14 1/4"x 41", then add the two inch mat in the color of your choice. The website will do the rest by calculating the inside dimensions of the frame based on the Mat size. If you need to call us, please do. We are happy to give you any guidance you need. We can be reached at 1-800-332-8884. Happy Framing!